U.S. officials have confirmed that rebels in Yemen have fired missiles at the USS Mason warship, according to a report. 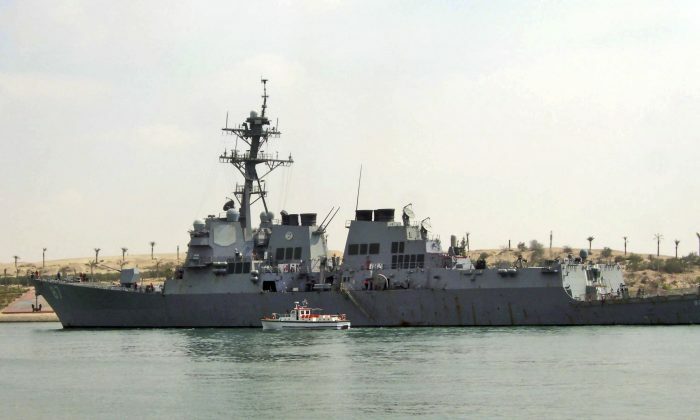 NBC Nightly News and Reuters reported that the Navy destroyer was targeted on Wednesday in a failed missile attack in the Red Sea. It was the second such incident carried out by Iran-controlled Houthi rebels, officials told the news agency. BREAKING: US military officials: USS Mason again targeted by missiles fired from Houthi rebel-controlled area of Yemen; ship not hit. In both incidents, the missiles didn’t hit the ship or cause any damage as it operated north of the Bab al-Mandab Strait, said officials. The USS Mason fired defensive shots in response to the missiles. The ship was accompanied by the USS Ponce, an amphibious transport dock. According to USNI, a news agency operated by the Navy, the USS Mason fired three missiles to defend itself and the Ponce during the first attack on Sunday. Two suspected cruise missiles were fired by the Houthi forces on the Yemeni shore. A defense official said the Mason “employed onboard defensive measures” against the first suspected cruise missile but “it is unclear whether this led to the missile striking the water or whether it would have struck the water anyway,” according to USNI. After the attack on Sunday, the Houthis, which are battling Yemeni government forces, denied any involvement in the attempt to strike the USS Mason.